Note: The Garmin GPSMap 60cx is identical to the 60csx but omits the barometer/altimeter. We are often asked by outdoor enthusiasts if there’s a single unit we can recommend that will provide turn-by-turn directions in the car, guide you to your favorite dive spot on the water using nautical charts (BlueChart) and will also guide you along the trails of the backcountry using topo maps. The 60csx covers all of these activities masterfully and others you may never have even heard of, like geocaching, the increasingly popular game of hunting for hidden “treasure” using GPS. The 60csx sports a dedicated geocaching mode. Simply stated, Garmin’s GPSMap 60csx is the most versatile GPS unit we’ve reviewed. (Note that although the 60csx does provide you with turn-by-turn directions in the car, it does not provide voice-guided directions, so if you’re looking for a unit for use primarily in your car, you might want to have a look at our Vehicle GPS page where you’ll find many units with the voice feature. Rounding out the rich set of features, the 60csx also incorporates a barometric altimeter for highly accurate elevation information along with an electronic compass that displays your heading while standing still, something a GPS alone can’t do. The 60csx includes a blank 64 MB microSD card and you can purchase additional microSD cards pre-loaded with MapSource® Topo and inland lake maps, BlueChart® marine cartography, and City Navigator™ street maps. Now you don’t need your computer every time you want to load a new map, just swap cards — a great convenience, especially in the middle of a trip. As a marine GPS, the 60csx has all the features you’d expect, including, of course, the ability to load BlueChart nautical charts, anchor drag alarm, sun/moon rise/set calculator and real-time tide information. Its bright, sunlight-readable display (1.5” W x 2.2” H, 2.6”-diagonal, 256-color transflective TFT 160 x 240 pixels) is easy to see under virtually all conditions. In the Box 60CSx unit, 64 MB microSD card, belt clip, USB interface cable, MapSource Trip and Waypoint Manager CD, lanyard, owners manual, and quick-start guide. 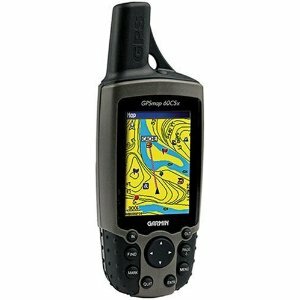 Got the Garmin GPSMap 60csx Handheld GPS Navigator at Amazon at a good price. However, to make it useful I would have to purchase at least 1 database for almost $100 and a larger memory card for $30. In my opinion, not such a great deal.